The agent is the first product developed by Marbocote exclusively for the Brazilian market. Redelease, a Brazilian distributor of specialty chemicals, has introduced a semi-permanent mold release agent into the Brazilian composites market. Developed by English company Marbocote, Ycon CR8 can reportedly cover, after the application of four layers, from 20 to 25 m2 of surface. ‘This is a better performance than the products currently available in Brazil,’ said Roberto Iacovella, managing partner of Redelease. This story is reprinted from material from Redelease, with editorial changes made by Materials Today. The views expressed in this article do not necessarily represent those of Elsevier. Florence Chemical Industry (FCI) says that it has completed one year of semi-permanent composite release agents manufacture in Brazil. 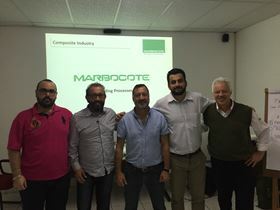 Fibermaq, a Brazilian provider of machinery for composites molding, has supplied three machines to the local Brazil operations of Italian company Polynt.